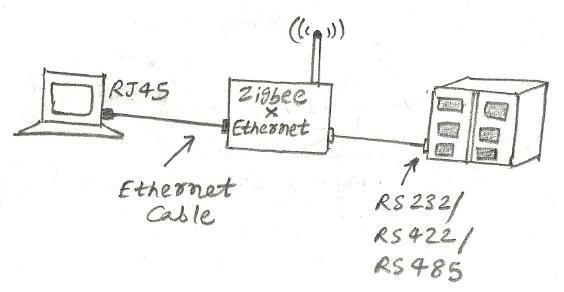 zigbee to ethernet converter is used to connect ethernet compliant devices having ethernet port to interface with zigbee wireless network. It operates as per IEEE 802.15.4 and ethernet standards. mesh and star network topologies are supported. It has 128 bit AES encryption and works on DC power input. It supports 99 nodes per network. zigbee router,zigbee bridge are the popular name which performs the same function as described above depending upon the interface requirement. The ethernet interface supports 10/100Mbps with RJ45 port, RS232/422/485 serial interfac ports. One such example is NPort Z3150 from MOXA. It acts as Zigbee Coordinator. This can be interfaced with ethernet port of the system as well as zigbee router or end devices. Figure depicts the same. It supports data rate of 250kbps in the 100 meter coverage. Operates at RF frequency of about 2.4 GHz. Another popular one is XBee® to IP gateway from Digi International Inc. provides connectivity between zigbee wireless network and IP network. Following are reputed zigbee to ethernet converter manufacturers which also covers zigbee to RS232/422/485 converters.